High Density Cleaner is used in paper pulping process. It can remove various kinds of heavy impurities, and it is a common used equipment in paper pulping process since it has the advantages of high cleaning efficiency, low loss of fiber long working life and etc. High Density Cleaner is an infrequent pulping equipment which doesn’t need a motor. It take advantage of the different proportion of fiber and impurities to separate them.Slurry enters cleaner in the tangent direction from feed pulp. Because of the different eccentricity,heavy impurities is pushed toward shell wall, and with the action of gravity, it finally falls down to the sediment trough. At the same time fiber gradually runs to central low-pressure area and spiral rise after arriving at the bottom. The pressure difference is about 0.05~0.1MPa. 2.High cleaning efficiency avoids the accumulation of ash content in latter sections. 3.High reliability of operation; would not be blocked. 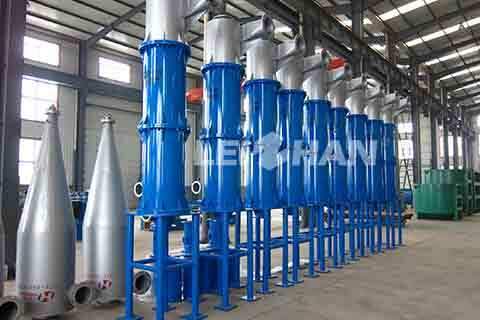 Leizhan provides various kinds of paper and pulping equipment, welcome to contact us for more details.